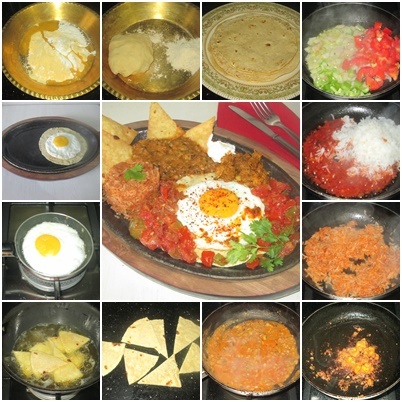 This is a classic Mexican breakfast of fried eggs served on tortillas along with accompaniments like cooked tomato salsa, refried beans, Mexican rice, Tortilla chips, Hung curd to replace sour cream and Goan Chorizo.. This is such a lavish spread and can be taken as brunch actually. 1. mix all the ingredients and knead with sufficient water to make a soft dough. 2. Roll out round tortillas and roast them on a griddle. Mexican seasoning .... 2 tsps. Hung curd flavoured with crushed garlic. 1. Soak the rajma overnight and boil it adding salt. Mash it. 2. Heat a little oil and saute the garlic. 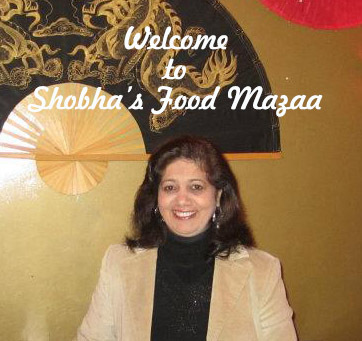 Add the mashed rajma, lemon juice, cumin powder and chilli flakes. Keep the consistency as per your liking. 3. To make the Mexican rice take a saucepan heat a little oil and add a spoonful of tomato puree.Add the cooked rice, red chilli flakes, salt, 1 tsp Mexican seasoning and cumin powder. Mix well. 4. To make the tomato salsa, heat oil and add a little garlic paste, chopped tomatoes, capsicul pieces and saute. Simmer until cooked. Add salt and chilli flakes and 1 tsp Mexican seasoning. 5. Now take a tortilla and pan-fry it lightly on both sides using very little oil. 6. Cut the chorizo into pieces and saute it with little oil. 7. Cut a tortilla into triangular pieces and deep fry it until crisp. 1. Lightly heat the tortilla on both sides. 2. Take a serving platter and spoon a little sauce. Place the tortilla on it. 3. Fry the egg sunny side up. 4. Place it on the tortilla. 5. Spoon the rice and refried beans on the side along with some cooked salsa,garlic flavoured hung curd and tortilla chips. 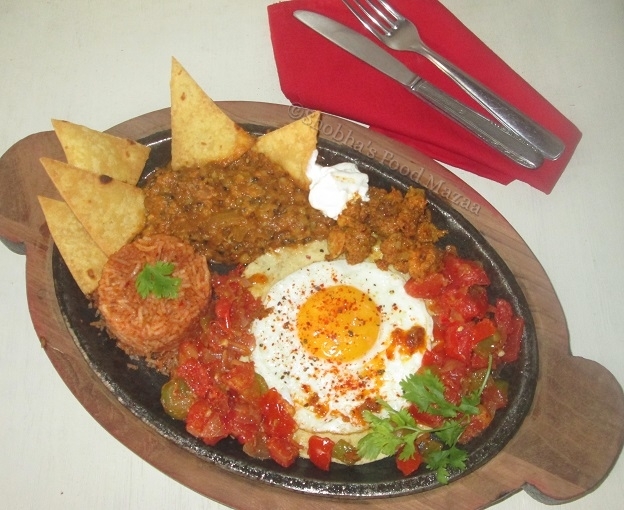 This dish is usually served in a skillet or a hot plate. Yes it is Rafeeda.. That's why I eat it as brunch.